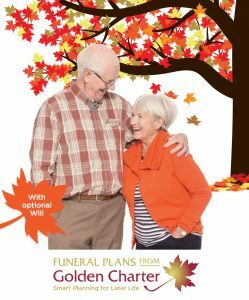 Thank you for finding out more about Independent Way Plus Funeral Plans. As an independent funeral director, our plans provide an easy way to organise your funeral arrangements with us, specify your wishes and take care of the costs in advance. It’s a thoughtful way to plan ahead and a chance to avoid the rising cost of funerals. We offer a number of ways to pay for your funeral plan – simply choose the one that’s right for you. You can make a one-off single payment for immediate cover. You can pay by debit card, credit card or cheque. If paying by cheque, please remember to return it, made payable to ‘Golden Charter Trust’, with your application form. If you have chosen to include a Will with your plan, as an additional benefit with this payment option, you will receive 10 years of secure storage and updates. This is available as an optional extra costing £200 (payable in full) with the other payment options detailed below. If you would prefer to spread the cost, you can pay by 12 monthly payments by Direct Debit at no extra charge. Just select this option and complete the Direct Debit Instruction on your application form. A small initial deposit is required. You will be fully covered once the plan is fully paid. If you would like lower monthly payments, we offer payment terms of between 2 – 30 years, making our plans even more affordable. Payable by Direct Debit, the monthly installment will depend on your choice of plan and the number of years over which you would like to pay. This option is available if you are aged 78 or under at the time of application. You will be fully covered at the end of the payment term. We also offer fixed monthly payments where you pay a fixed monthly amount by Direct Debit, based on your age (at time of application) and choice of funeral plan, which is payable until the age of 90 or death if earlier. This option is available if you are aged 50 to 80. You will be fully covered after two years’ consecutive payments. The total payable could potentially be higher than the cost of your funeral plan.